In many ways, injury law comes down to a question of cause and effect. Our San Francisco motorcycle accident attorney and his support team work diligently to determine (and prove) what caused the accident, the question of fault, and what has and will happen as a result, the question of damages. The “effect” inquiry looks at both today and tomorrow, an especially complex inquiry in the case of the serious injuries or loss of life that are far too common in motorcycle accidents. That is, however, a question for another day. Today, we discusses the “cause” inquiry, the question of what happened in the moments before the crash, looking at a recent tragedy in San Ramon and the leading research on the cause of motorcycle accidents. Ultimately, the cause and effect inquiries may be complex but our team is well-equipped to uncover the truth in order to help injured riders and grieving loved ones recover compensation for their losses. A multi-vehicle accident led to the death of a motorcycle rider in San Ramon on Monday. CBS San Francisco reports that the crash occurred around 4:40 A.M. on Highway 680 South just past Bollinger Canyon Road. The incident began when a Honda rear-ended a big-rig truck and the impact caused the Honda to spin before coming to a halt in the middle of lane three. A motorcycle then struck the disabled vehicle and the 39-year-old rider was ejected. Moments later, another big-rig truck hit both the motorcycle and the rider before catching aflame. The motorcycle rider was pronounced dead at the scene. CBS’s article does not note the status of any of the other individuals involved in the complex accident. According to the most recent National Highway Traffic Safety Administration (“NHTSA”) Motorcycles Traffic Safety Facts sheet, 4,668 riders died and some 88,000 motorcyclists were injured in traffic accidents nationwide in 2013. While motorcycles made up only 3% of vehicles registered in the U.S. in 2013, motorcyclist fatalities accounted for a disproportionately large share of all traffic deaths at 14%. Rider injuries were a more commensurate 4% of all traffic crash injuries. The true disproportionality of motorcyclists’ share of both traffic deaths and injuries is evident when one considers that motorcycles travel accounted for merely 0.7% of all vehicle miles in 2013. Taking these statistics together reveals that for every mile travelled motorcyclists were 26 times more likely than passenger car occupants to die and about 5 times more likely to be injured. Approximately three-quarters of studied accidents involved a collision between a motorcycle and another vehicle, while around one-quarter were single-vehicle incidents. In two-thirds of the multi-vehicle accidents, the driver of the other vehicle was responsible for causing the accident and had violated the right-of-way of the motorcycle. The most predominant cause of the studied motorcycle accidents was the failure of motorists to see the motorcycle either at all or until it was too late to avoid a crash. The most common configuration in the accidents involved an automobile making a left turn in front of a motorcycle that is traveling straight. 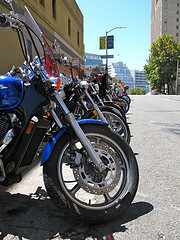 On the side of the motorcycle operator, insufficient attention was the most common factor contributing to an accident. Although the Hurt Report helps identify some of the most common causes leading to motorcycle accidents, the reality is that cause is rarely a simple inquiry. In many (if not most) accident cases, multiple factors combined to lead to the plaintiff’s injuries. The San Ramon tragedy is one example of a real-life accident that involved several smaller accidents and countless decisions on the part of both the drivers and the rider. Motorcycle accidents can feel overwhelming, especially when it is you or a loved one who was injured. Rest assured that our accident team works on complex cases every day, including cases in which more than one person was at fault. We know how to read accident reports and work with experts to determine the various factors that led to the crash(es) and we know how to prove fault in court. A final note — If you are worried because you may have contributed to the crash, rest assured that the law does not demand perfection. Cause is a complex inquiry, something that the law and our legal team understand. California law allows injured people to recover money even if their own negligence contributed to the accident. Call to learn more.